Whalen Vankin is the world's greatest wizard, and he has only ever personally trained two other wizards. One is Alexander Taylor, a young man who has earned a reputation as a brave adventurer, a warrior, and man of honor. The other is Jabez, Vankin's nephew and a man whose choices have led him down a different, darker path. Dark magic has covered Westland, and evil is stirring. Whalen and Alex must journey together into the heart of danger, confronting a sea serpent, battling their way through a goblin army, and facing down more than one dragon. 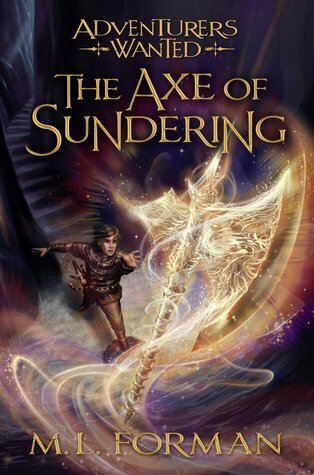 Alex must find the legendary Axe of Sundering the one weapon that offers a chance to defeat Jabez and protect the land from the dark wizard's plans. But finding it will be an adventure of its own as the only pathway to the Axe leads through the underground tunnels and secret passages of Castle Conmar. But Jabez has one final weapon at his disposal: the powerful Orion Stone, which could spell the end to Whalen and Alex both. After a wait of several years, I'm thrilled to have finally had the chance to read the last book in the Adventurers Wanted series. I'm also sad that the series has ended. It's always sad to say goodbye to favorite characters. In this last book of the series, Alex, a young wizard, adventurer, and dragon lord, sets off with his mentor, Whalen Vankin, to address the evil actions of Vankin's former apprentice and great-nephew, Jabez. At the same time, they are trying to figure out what the evil organization known as the Brotherhood is working toward. But to have a chance to defeat Jabez or the Brotherhood, they must travel incognito and at a slow pace. Neither of these things come easy to Alex, especially once he learns that Jabez has a dragon enslaved and is starting warfare throughout the land of Jarro. And the greater uncertainty is that the only way to defeat Jabez is with the Axe of Sundering, which Jabez has in his possession. Not only do Alex and Whalen have to try to sneak up on Jabez, no easy task with Whalen's natural connection to his former apprentice, but they have to get their hands on the Axe before they confront him. Alex has survived many challenges over his years as an adventurer, but he's never faced the kind of evil that the Brotherhood represents, having built itself over 2,000 years. But failure means the enslavement of the entire known lands, something that Alex can't abide. This is a nice, exciting ending to a thoroughly enjoyable series.